Now that summer is coming to a close and the kids will be heading back to school, it’s time for this mama to focus on herself a little bit more and some health goals I have for myself. This summer has consisted of a lot of sleeping in, hosting kids’ friends over at the house (moving into a new house), driving kids here, there and everywhere and just overall being pretty laid back. Well, I started with a running goal at the beginning of the summer and didn’t even come close to meeting it. I’m not sure if I can blame it on the move, on the Texas heat or what – but the goal was not met by a long shot! I’m definitely looking forward to getting back into running and thanks to Reebok I have a fantastic pair of shoes to get me on my way. A few weeks ago with my Famous Footwear gift card in hand, I headed to the store to purchase a pair of Reebok athletic shoes. I haven’t bought Reeboks in years so I honestly wasn’t sure what to expect. I have a thing for pink when it comes to my shoes, so that’s one feature I was looking for and did I ever luck out. Would you like to see what I ended up buying. Obviously I went for comfort as well, since I will be running in these! (But the fact they’re pink and black helped!) They fit my feet perfectly. I’ve already been running in them several times and I love them. I have major issues with shin splints, which has kept me from being able to run before and has also made me extremely picky when it comes to the types of shoes I can run in. I have yet to have a problem with these – which is wonderful. I’ve been doing the Couch to 5K program with plans of running a 5K with my daughter and some friends in the fall. My daughter is dying to do a color run. Have you stopped in a Famous Footwear lately? Have you purchased a pair of Reeboks lately? 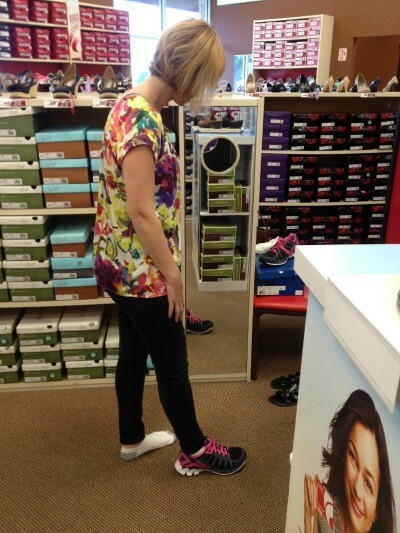 We actually went back to Famous Footwear to shop for my 14 year old son’s Back to School shoes and hit the jack pot. We took advantage of their BOGO (Buy One Got One Half Off) deal, plus we used my 20% off rewards deal, plus I had a $5 off from something I don’t even remember. All I know is we walked out of there only spending around $64 for 2 pairs of really nice shoes. I was floored and my bank account did a little happy dance. I’m not sure how much longer the BOGO sale or the 20% off rewards deal is going on, but hop on it as fast as you can! Previous article7 Pairs of Wink Eyewear; 7 Outfits; Plus Enter to Win 1 of 1000 Pairs of These Stylish Glasses!